kind of like he is still in the pasture. People have asked how we came up with the name Cactus Rose. The name comes from a line in an old western that compared the color of a woman’s cheeks to a cactus rose. Who would have guessed then that the line from The Man Who Shot Liberty Valance would help us name our very own longhorn herd nearly 40 years later. We were considering the notion of Cactus Rose when we found a prickly pear in full bloom growing in the fork of an oak tree on our place. After that discovery, we were certain - Cactus Rose Longhorns was born! 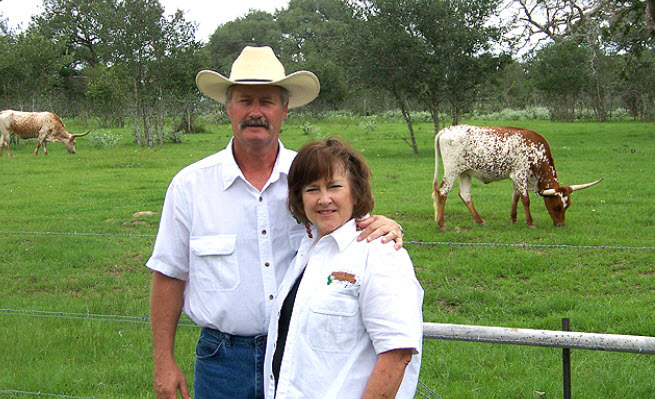 You will always find registered Texas Longhorn heifers, bulls, and steers for sale on the Cactus Rose Longhorn Sale Pen page. This last year we chose to downsize as we were running two separate herds, made some very tough choices, and kept the animals we thought we could best continue with. Visit our website often and watch as the Cactus Rose produces more gorgeous animals. For more information- e-mail us!